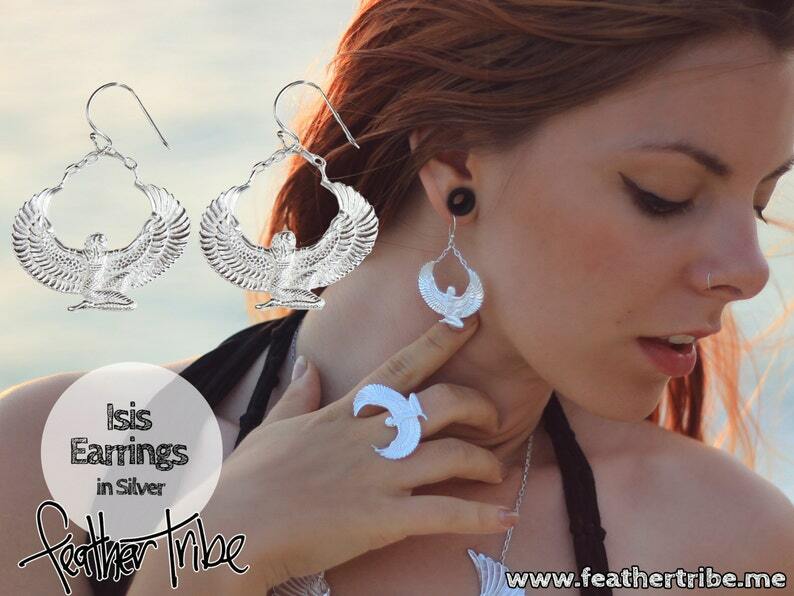 The Isis Collection is honouring the winged goddess. Isis, from Egyptian mythology, is the goddess of love and magic. Wear these powerful amulets to promote the divine within us all. "Isis, the one who is all. The giver of life and goddess of magic. May I embody your divine femininity, your inner strength and powerful protection. With my own wings, I embody the confidence to fly high, remaining patient with feet on our earth. I sit with power for the greater good on my throne. Protect me, love me, and empower me great Isis." The Isis measures 4 cm wide and 3 cm tall, and the earrings hang 3.5 cms long. These earrings are first hand carved, then cast in white brass and dipped in silver. The shepherd hooks are allergy free sterling silver. Some think it is an eagle, others a garuda...but always, always, it receives compliments. It is a thing of beauty and power and best of all, so comfortable to wear. I don't usually enjoy wearing necklaces but I can hardly feel it around my neck! Thank you Feather Tribe!